Ozeki NG SMS Gateway gives SMS functionality to MOM 2005. With this solution your It environment will be safer and more effective. MOM 2005 manages and monitors the whole computer system and sends notifications to the administrators if a problem occurs. In this installation guide you can learn more about this solution and about the implementation of it. The installation of this application is easy and you will find help in the pictures and installation videos. 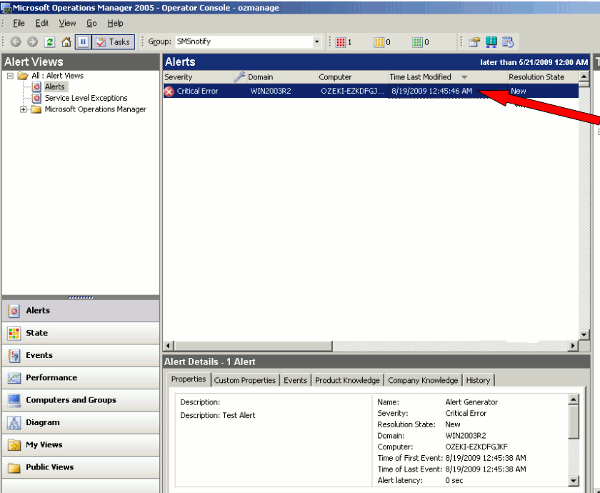 Microsoft Operations Manager 2005 is a powerful software to monitor and manage server and client systems. The agent on the monitored computer watches several sources, including Event Log for specific events or errors generated by applications. MOM 2005 Integration with Ozeki NG SMS Gateway is the best solution if you would like to send SMS messages to mobile devices any time you need. With this option your business life will be more effective and competitive as you use the highest quality communication techniques. Ozeki NG SMS Gateway is quick, reliable and easy to setup. Your IT environment will be safe and more efficient. With this solution you can send alerts, notifications and reports from MOM 2005. 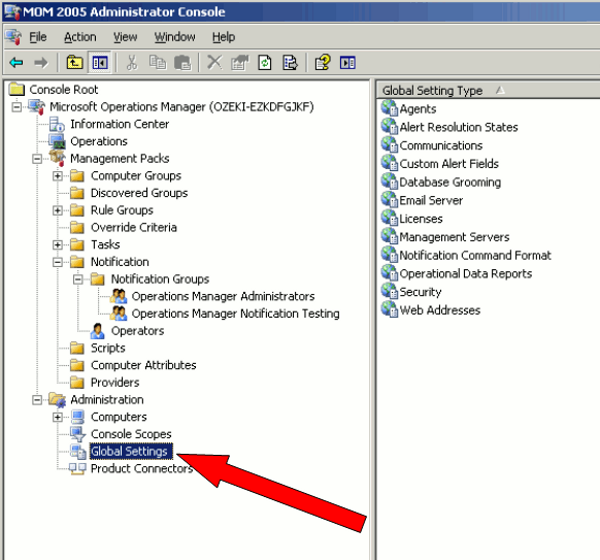 On this page you can find additional information on how to send SMS from SCOM 2007 and how to configure it correctly. To run this software properly, you need to meet some requirements. Please check the list below (Figure 1). *The SIM card will come with a plan that will determine how much money you will spend on each SMS. If an alert occurs MOM 2005 generates a report for the administrator. Ozeki adds the extra function of sending SMS message about this report to the user. The agent notices the alert and generates a critical error which is processed by MOM 2005. 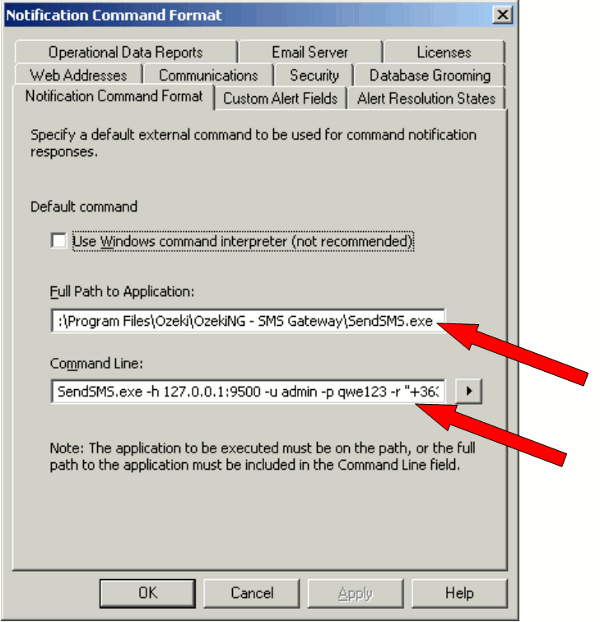 The Command Notification Channel of it is in direct connection with Ozeki NG SMS Gateway's Command line Tool which interprets the message. After this, it forwards the message through COM1 channel to the GSM modem or to the IP SMS connection. With SMPP (Short Message Peer-to-peer) protocol it is then sent to the SMSC (SMS Center) and finally, the SMS message is sent to the given mobile phone. In Figure 2 you can see how it works. To install and configure Ozeki's solution for MOM 2005 please follow the steps below and watch the video tutorials at the top of the page. To do this, open the Administrator Console. On the left hand side, choose the Management Pack menu and Notification sub-menu in it and click on Operators (Figure 3). In the Action menu, click on Create Operator (Figure 4). 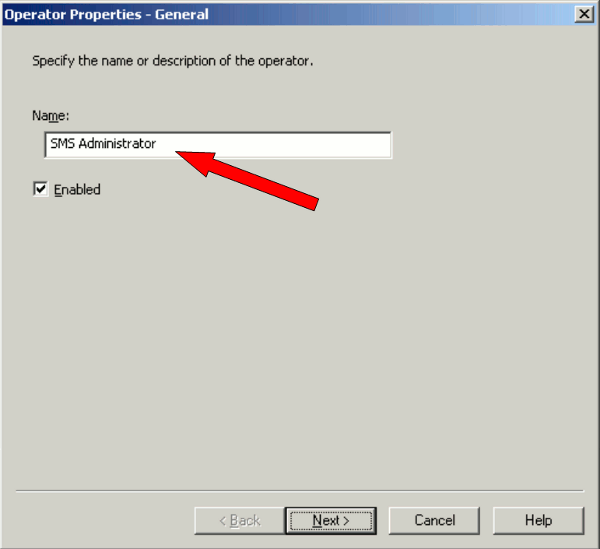 A window appears, type the name of the operator in, for example: SMS Administrator (Figure 5), click on Next. 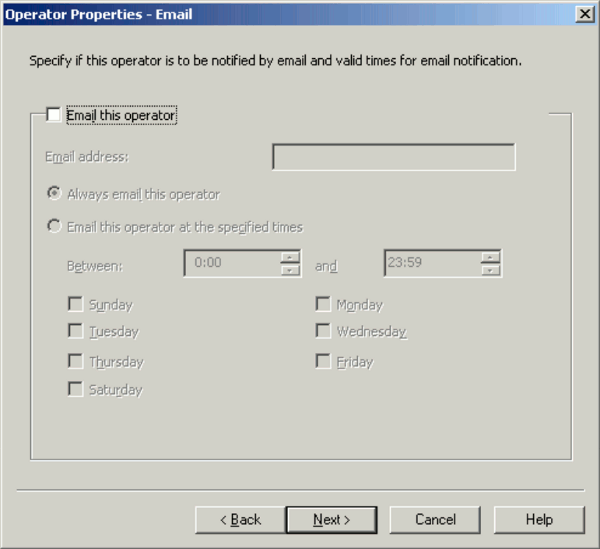 The following two options are about the setting up of the e-mail (Figure 6) and page (Figure 7) the operator's addresses. If you do not want to notify this operator by e-mail or by page, click on Next. 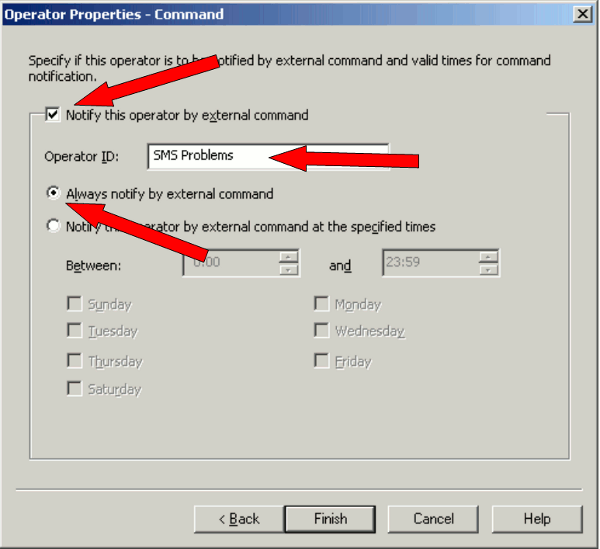 On the next page, choose the Notify this external command option and below this, type the Operator ID, for example, SMS Problems (Figure 8). Then choose a specified time to notify this operator. By default the operator always gets notification messages. After it, click on Finish. If you did it right, you see the created operator at the Operators list (Figure 9). 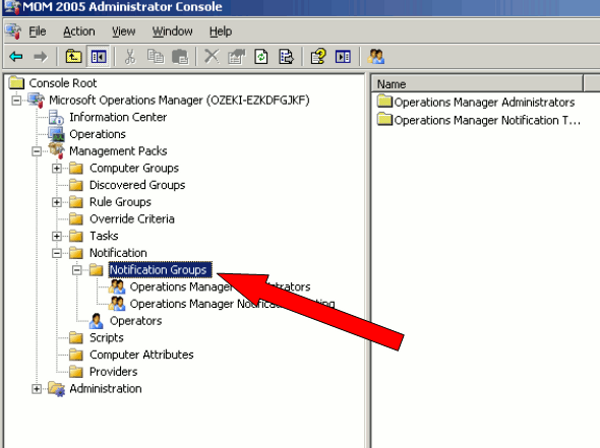 Then you need to add this operator to an existing group: In the Notification menu, choose Notification Groups (Figure 10). 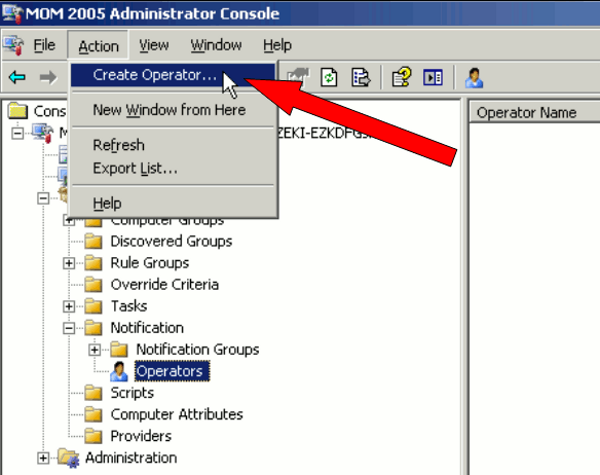 Double click on the chosen group you want the operator to be in, for example, Operations Manager Administrators (Figure 11). 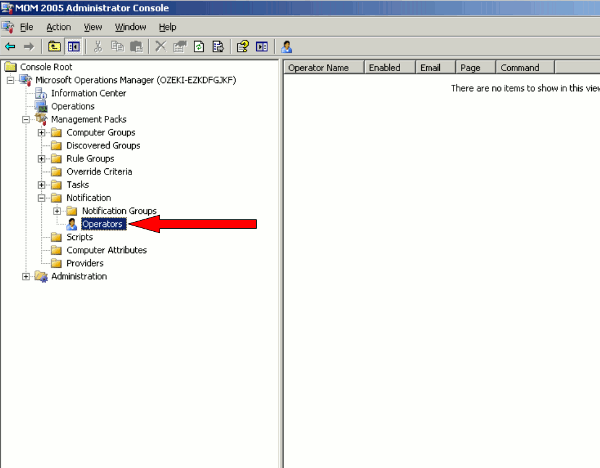 Choose an operator you wish to add from the available operators and then on the Add button between the two tables (Figure 12 ), if you have done it, you can see the created operator in the Group Operators (Picture 13). 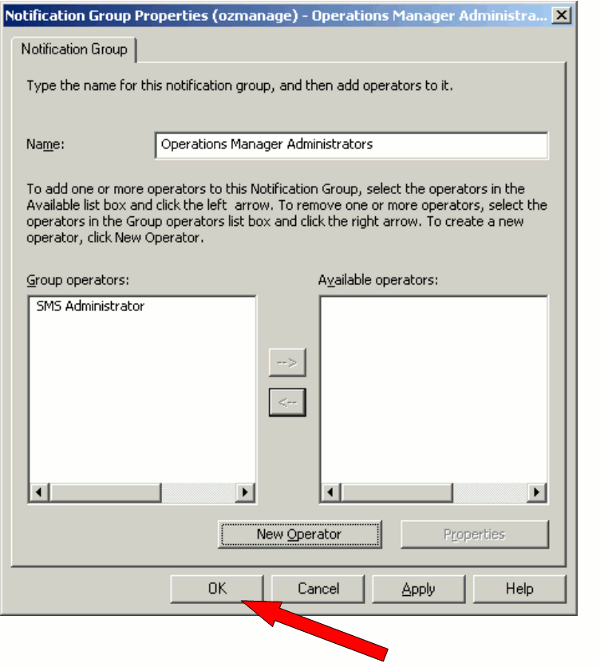 Click on OK.
To set up Operation Manager for sending SMS messages first click on Global Settings (Figure 14) in the Administration menu. 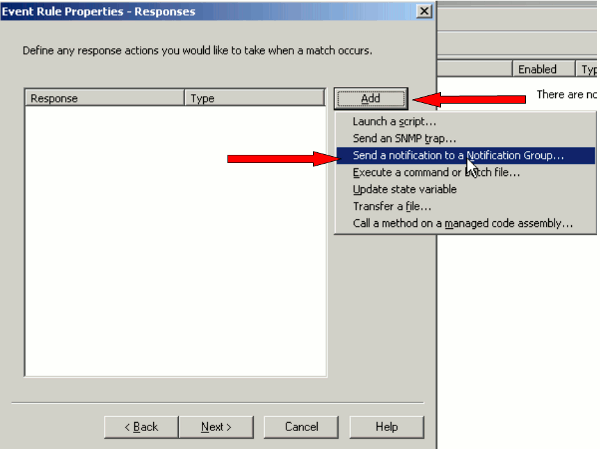 Then select Notification Command Format from the Global Setting Types and double click on it (Figure 15). SendSMS.exe -h 127.0.0.1:9500 -u admin -p qwe123 -r "+36301234567" -m "$Alert Name$ - $Alert Description$"
You can change the $Alert Name$ and the $Alert Description$ values in the command line by clicking the select button on the right hand side (Figure 16). 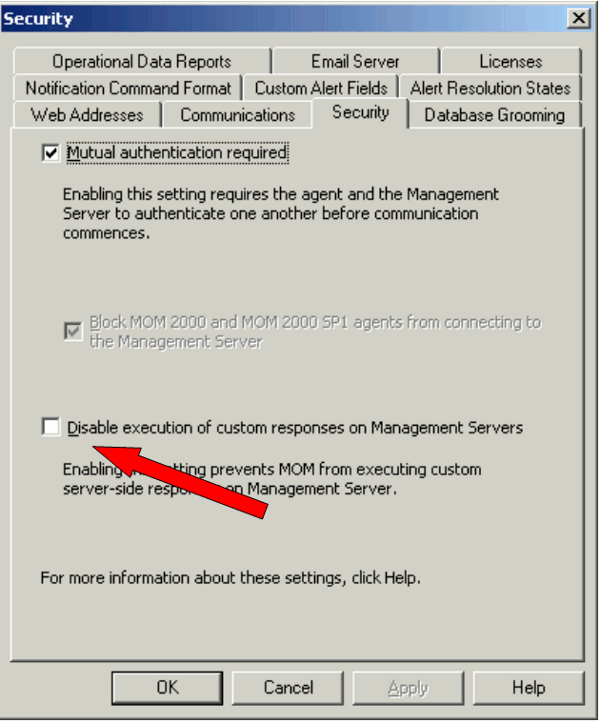 When it is done select the security tab at the top of the appeared window and uncheck this option: Disable execution of custom responses on Management Servers (Figure 17). Click on OK.
With these steps the configuration is completed and now you can test the system. To test the system you need to create a rule which will generate an alert and send the SMS message. You need to know which rules are applied to the management computer. First, in the Administration menu select Computers sub-menu and then the Management Servers. Then double click on the present computer name (Figure 18). 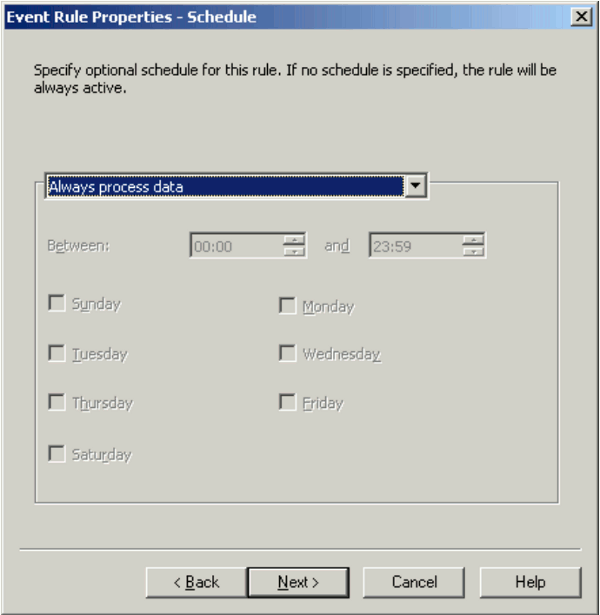 A window appears and on the top of it, select the Rules tab. Now you can see which rules are applied to the management computer (Figure 19). 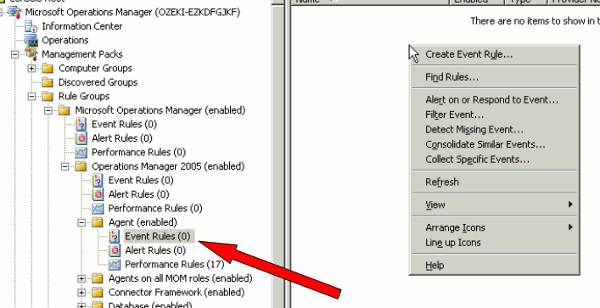 Click on OK.
From the Management Packs menu choose Rule Groups. 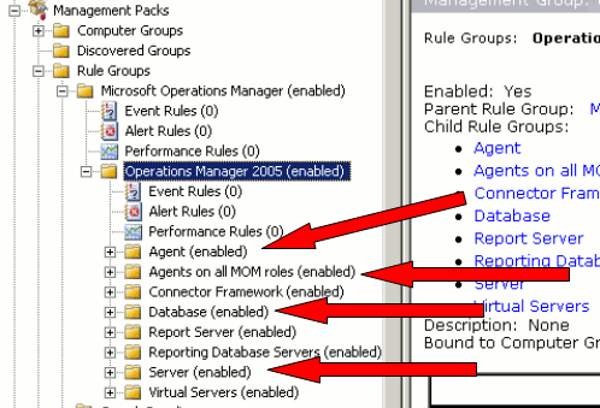 Then expand Microsoft Operations Manager and Operation Manager 2005 in it. Here you can see the groups of rules that are applied to the computer. You can see that the agent group is also applied (Figure 20). 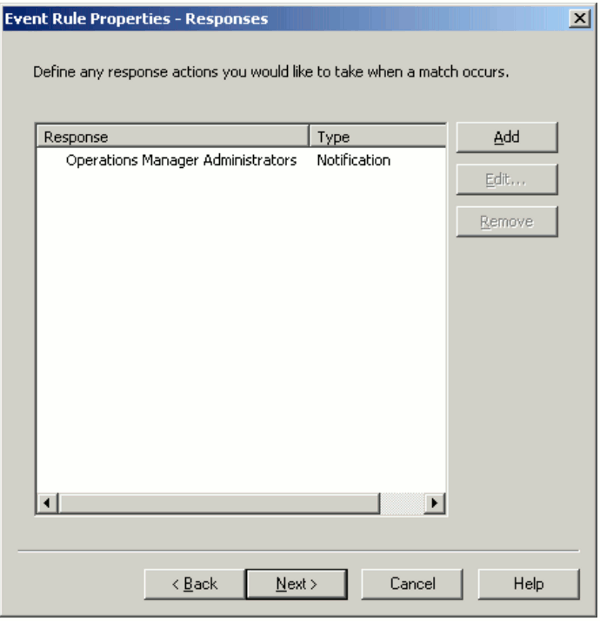 Now you need to create a rule that will be a part of the Agent group: Expand the Agent group and right click on Event Rules and select the Create Event Rule (Figure 21). 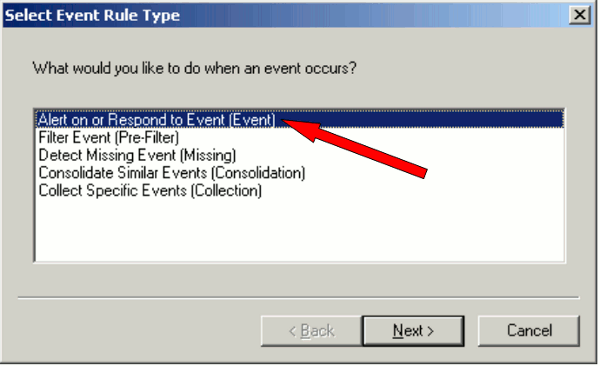 A window appears, select the type of the event: Alert on or Responding to Event (Figure 22). Click on Next. 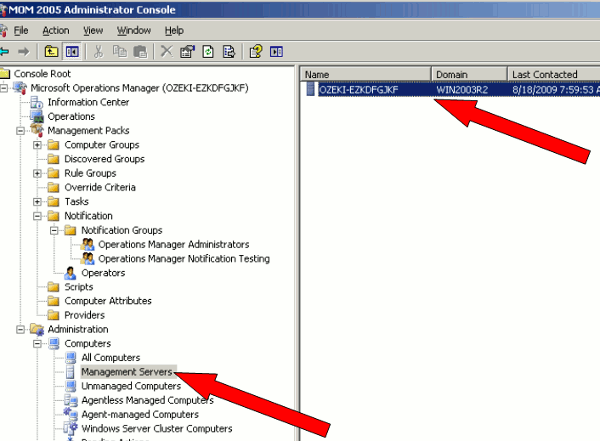 Now choose the provider name in the appeared window: Application (Figure 23). Click on Next. In the next step define a criterion for the event: e.g. 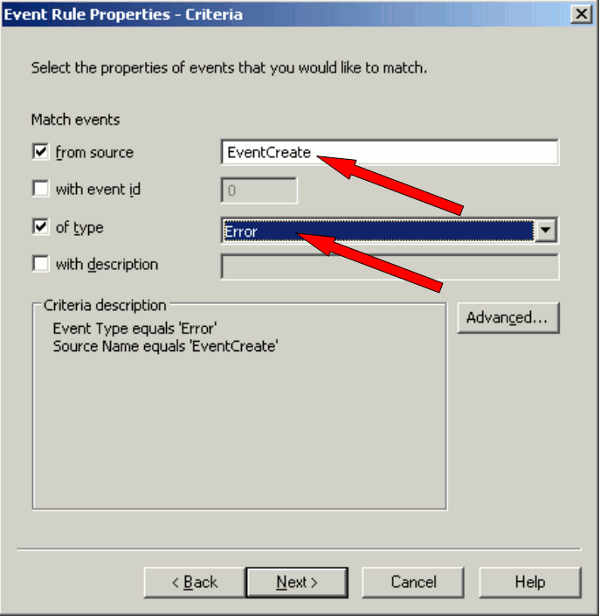 click on 'From source': and type EventCreate and then select 'of type': and choose Error (Figure 24). Click on Next. In case you do not wish to schedule this rule, leave this option default (Figure 25) and click on Next. This step is about generating alerts. 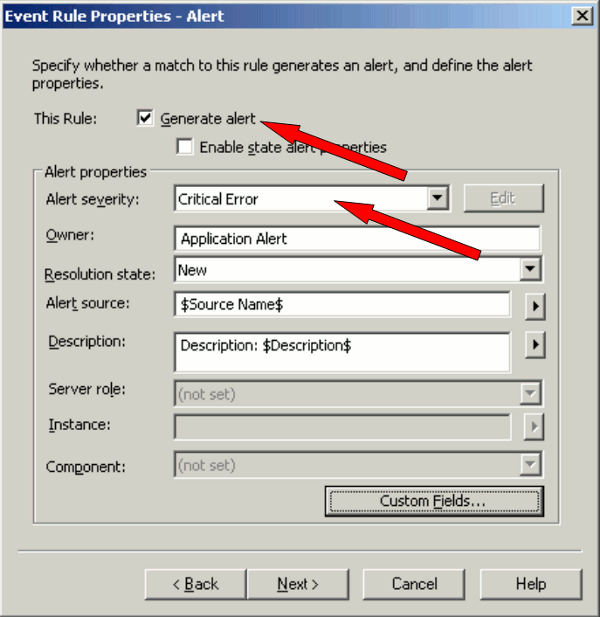 To see the created alert you need to generate a Critical alert and its owner is going to be Application Alert. 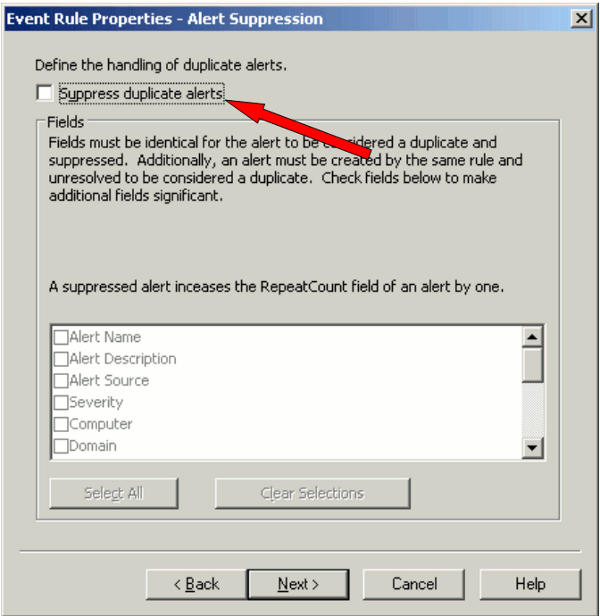 To do this in the Event Rule Properties window select the Generate alert option. In the Owner line type Application Alert (Figure26). Click on Next. 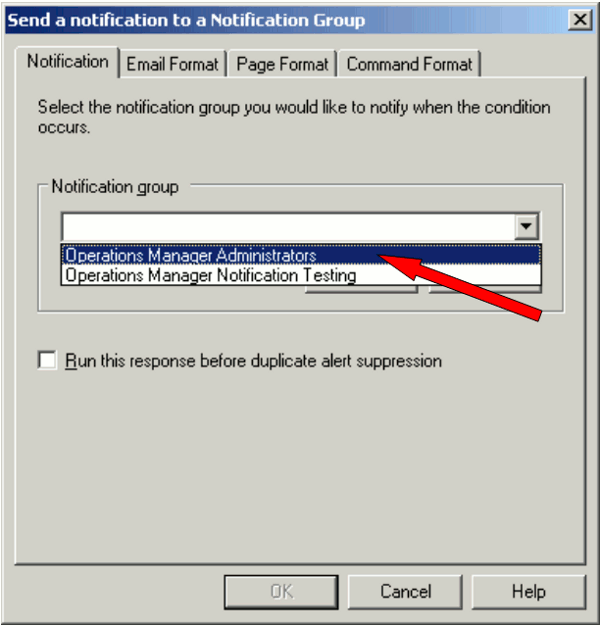 If you want to treat all alerts as a new alert then uncheck this option: Suppress duplicate alerts (Figure 27). Click on Next. You can create a response to this alert by sending a notification to the Notification Group: Click on Add and select the Send a notification to a Notification Group option. 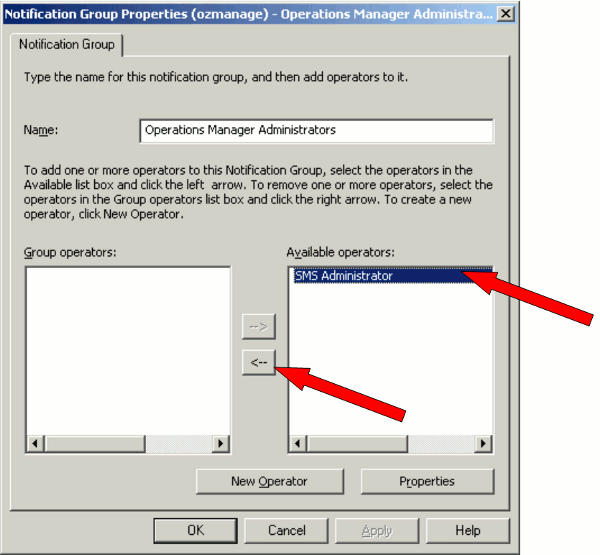 Select a Notification group you wish to alert (Figure 28), for example, Operations Manager Administrators (Figure 29).Click on OK and Next. When you are finished, the Notification Group and the type of notification appear in the list (Figure 30). 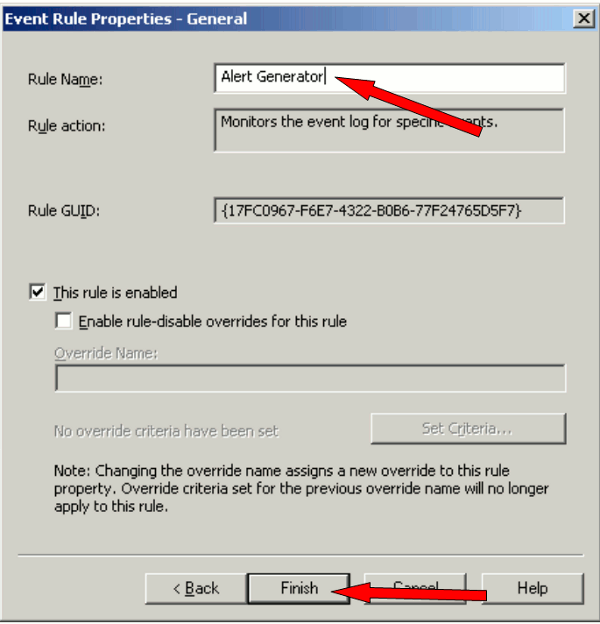 In the appeared window, Event Rule Properties-General, you need to give a name to the created rule, so type in the line of Rule Name, for example, Alert Generator (Figure 31). Click on Finish. When you are finished, you can see the created rule in the Agent sub-menu, in Event Rules (Figure 32). 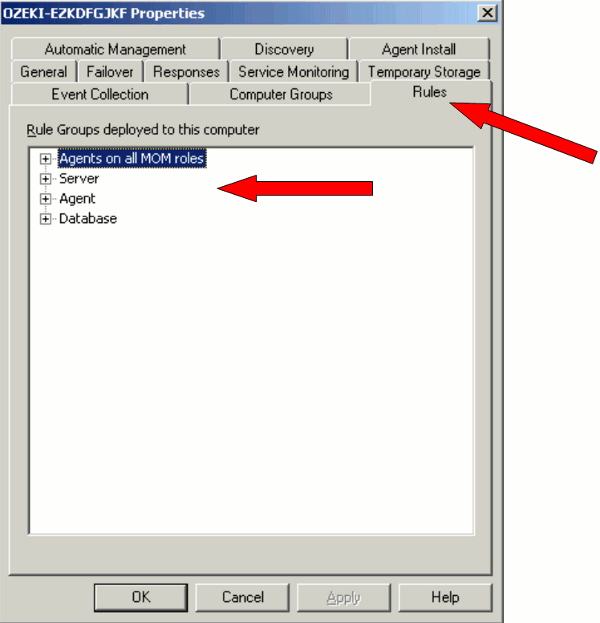 Then, to create an event use the Eventcreate command at the Command Prompt in the Administrator menu. 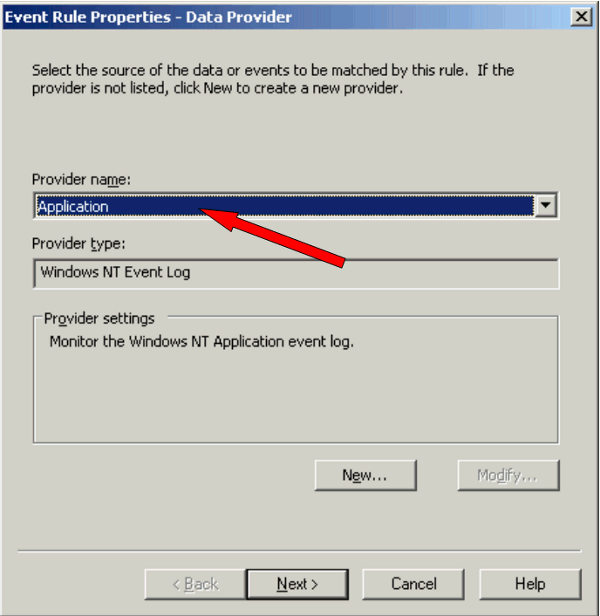 This command will generate an error in the application log: eventcreate /T ERROR /ID 1000 /L APPLICATION /D "Test Alert" (Figure 33). At the Operations console you see the generated Critical Alert (Figure 34) and at the Ozeki NG SMS Gateway you will see that the message has been sent (Figure 35). Thank you for visiting this guide. Please visit the Download page to download Ozeki NG SMS Gateway to be able to implement this solution!